Our Soundproofing Mats are made from a high density, closed cell foam that serves as an efficient sound barrier, sound absorber, and insulator. 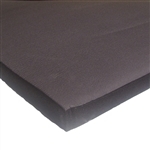 Closed-cell foam is an effective material for reducing noise reverberations, and the SoundAway Mat is moisture-resistant, mold-resistant, fire-retardant, and dust-free. 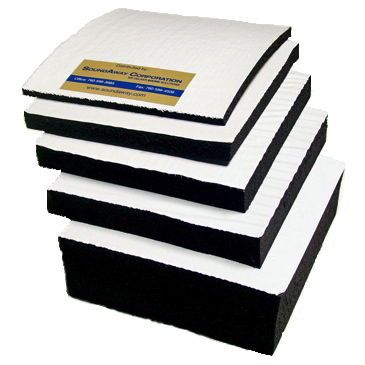 Our sound-blocking foam mats are pliable and easy to work with, and they install in minutes. The high-density closed-cell foam is perfect for floors and walls and for wrapping pipes or lining enclosures. Soundproofing Mat with pressure-sensitive-adhesive (PSA) is shown with the white adhesive backing on the smooth side of the mat. You'll save time installing Soundproofing Mat with PSA. All you do is measure, cut, peel, and stick the mat to the surface. Soundproofing Mat is cut from 4' wide rolls. For your convenience, we will cut as many feet as you need, up to the maximum roll length. Simply enter the length in the shopping cart. We'll do the rest. Also sold in full rolls. The SoundAway Mat is offered in 1/4", 1/2", 1" and 2" thickness offering the flexibility to choose a size that meets your sound reduction goal and fits in the space available, at a price that is within your budget. Need help selecting the right thickness for your noise problem? Call us at 866-768-6381, and we'll help you calculate material quantities, draft a quotation, and determine the most cost-effective shipping method.